SodaStream Genesis has an average rating of 4 out of 5 based on 2 user reviews. Comes with the soda maker, a 60L carbonator and a BPA-free 1L carbonating bottles. The SodaStream Genesis is easy to use like most soda machines from this brand. It does however have the inconvenience of the twist-on mechanism that is slightly longer than the snap-lock one. Attach it to the soda maker by twisting it on. Press the carbonation button 3 times (3 is the standard amount but you can do it more or less depending on your preferences). Remove the bottle by untwisting it. 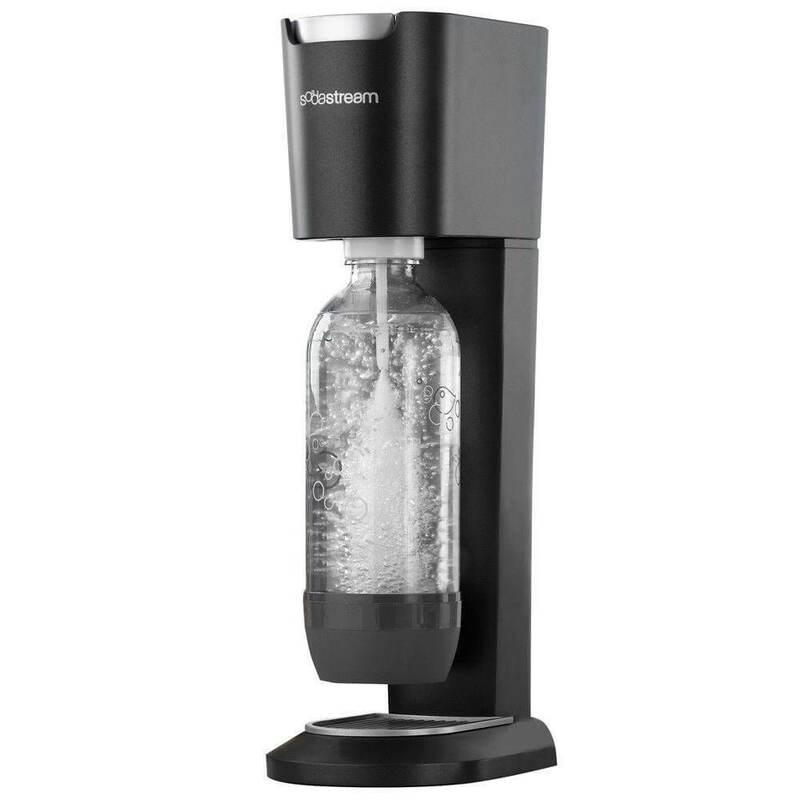 The SodaStream Genesis uses 60L SodaStream carbonators that, as their name implies, allow for carbonation of roughly 60L of water (most users do however report around the 50L range). Empty carbonators can be exchanged for full ones at various retailers such as select Bed Bath & Beyond, Costco, Target, etc. To find a retailer close to you.. Every exchange costs $14.99 but there are cheaper, DIY options. The SodaStream Genesis differentiates itself from the other soda makers on the market through the quality it offers especially relatively to its low price. Also, it comes with the longest warranty of all SodaStream machines and is easy to use/very simple as well. Even with all these advantages, it still manages to be easy and simple to use. Reviews for this SodaStream model are positive and average above 4 stars on Amazon. Users generally praise the price, the size, the appearance and the simplicity of the machine. A small amount of consumers have had issues with the carbonation button and reported that theirs broke. Nonetheless, other than complaints about the SodaStream refill system and its price, people seem to have really enjoyed the SodaStream Genesis. My sparkling water habit was getting quite pricey. So, I decided to give the SodaStream Fizzi a try. I cannot believe how much money I save in the long run. I have cut my costs to less than half of what I was usually spending. I am also no longer contributing to the aluminum can waste each month, which was close to 200 cans. The only problem I have with the soda maker is having to hand wash the bottles. I wish they were dishwasher safe. Otherwise, I am happy with the machine. I bought the SodaStream specifically for making sparkling water. I am not a fan of sweet sodas. I fill the glass carafes with tap water and store them in the fridge to get good and cold. The machine is easy to use and seems to be a quality product. The canisters last a long time for me even when I make sparkling water daily. The Genesis saves me a ton of money. I am also happy that I am not contributing to the abundance of plastic waste.